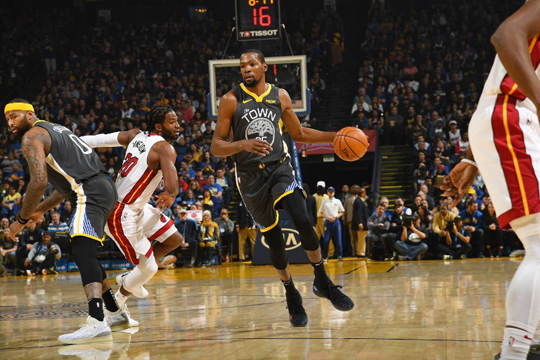 Los Angeles, United States—Kevin Durant scored a game-high 39 points as the NBA champion Golden State Warriors rallied from an early 19-point deficit to edge the Miami Heat 120-118 on Sunday. Durant responded with his first three-pointer of the contest—after six misses from beyond the arc—to tie the game and Cousins made his free throws to seal the Warriors’ 15th win in their last 16 games. Elsewhere, Joel Embiid scored 37 points and grabbed 14 rebounds to power the Philadelphia 76ers over the visiting Los Angeles Lakers 143-120 in a matchup of high-profile NBA clubs. Doncic was disappointed at missing two shots in the final 45 seconds.